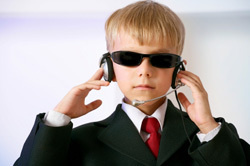 Parents who are indoctrinating their children to spite the ex will also enlist the child to become a surrogate spy. This can range from simple information about the ex’s new girlfriend, all the details of every breakfast and dinner (“what did you eat? What restaurant did he take you to?”) to doing complete hard drive searches looking for bank info, emails, or incrimining web sites. Vindictive ex’s would love to be able to rummage through your home to get interesting details on your life, including any and all “dirt.” They’re still very angry from the divorce or separation. But since they can’t break into your house without risking jail time, they recruit your child to act as a spy on their behalf. This is very damaging to the child, for a number of reasons. First, it makes the child believe that the parent and their house can’t be a normal environment. There must be something wrong with it if one parent needs all the details of what’s happening there. Second, it teaches that it’s OK to be sneaky and spy on somebody. Remember, kids model their parents’ behaviors. So a continuance brain bath in spying around a parent’s house for information to share with the other parent is very damaging to the child long term. Finally, by aligning the child in this manner, the vindictive ex slowly tears down the bond that exists between the other parent and the child. This intentional act of abuse on the child is terrible– it creates conflict and discomfort in a relationship where little to none even existed! Parents that do this are terrible parents. Period. When you catch your child reporting everything back to the other parent (I discovered mine through child therapist progress notes), it’s time to let the child know that you understand they want to “help Mom/Dad, but reporting back everything you do in such detail isn’t fun for them, it upsets the other parent, and it makes you work too hard, having to carry around a mental note pad every day.” Or words to that effect. Don’t embarrass or punish the child, or the behavior will continue and get even worse. Point it out without pointing a hard finger, explain why it’s not a fun or positive thing to do, and then drop it. Because time with you is damaging, of course! I’m experiencing in my case severe programming in a desperate attempt to sever my son’s relationship with me. One of the things my son’s mother does is place him into counseling after every father-son time we have. That’s right, usually the very next Monday or Tuesday after the Sunday evening exchange he is placed into child therapy. This has been going on for many months now. It’s very frustrating to see my 9-year-old son go from a highly enjoyable visit with me (my tactics in fighting back the brainwashing are slowly working, thank God), to being dropped into counseling. I set myself an appointment with the child therapist a day after my son was placed there, and the therapist said there were no issues in my son’s nearly 3 weeks with me. So why was he brought in? Counselor couldn’t answer. I believe that his mother thinks that time with me is harmful to him, that my being in his life is harmful to him, and that the way to “recover” from the awfulness of spending time with a (unwilling to be acknowledged by her) loving father is to get help from a therapist. 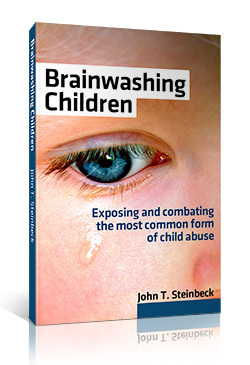 Unfortunately in my case the therapist is completely clueless to the brainwashing mother is doing– so clueless that he denies any active brainwashing is going on! Just some “influencing” in my son’s mind. By whom? I ask? “Perhaps a parent”… Please… This after the countless stories I’ve told him and the video and audio tape showing my son’s anguish. It’s a “he said; she said” thing according to him. When an ex places your child in counseling after nearly every visit with you, what message is that sending the child? That being with you is not a normal, OK thing. That obviously something not good or harmful certainly happened to the child during that time. If this happens to you, you need to be assertive in standing up to the child therapist on what exactly it is he or she is treating. See what codes are being documented on the billing to the insurance company. Sit in on sessions like I have, and take good notes. There are many incompetent child therapists out there. In my case, the therapist didn’t have much to say, and even prevented me from seeing the progress notes when I asked to see them– he needed to see legal proof of my rights to see them. Can you imagine any divorce decree where a parent is specifically denied access to medical records? Amazing. My battle is just beginning with that incompetent child therapist. Never assume that a therapist knows what he/she is doing and isn’t aligning with one parent over the other. Get your own trusted child therapist always.